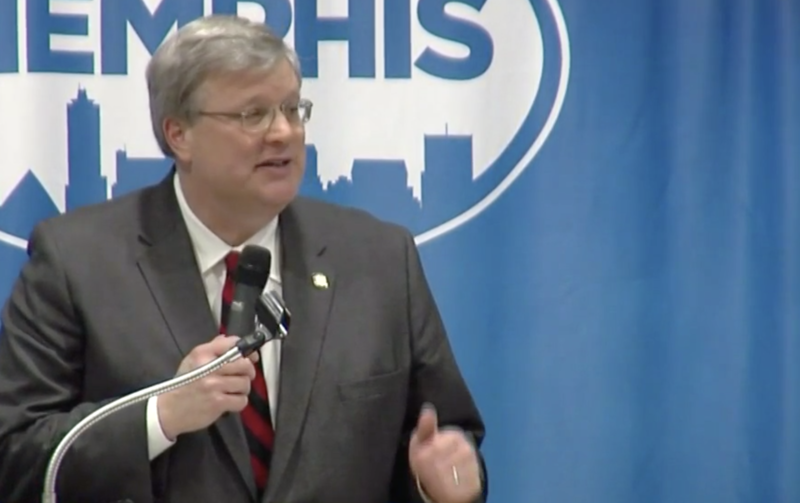 Memphis Mayor Jim Strickland during his State of the City speech. Memphis Mayor Jim Strickland went down to Whitehaven this week to make his annual State of the City address. His appearance in Elvis country, where millions have been invested sprucing up one of the city's most important tourist neighborhoods, had a symbolic resonance. One new proposal, the Memphis Community Catalyst Fund, would help fix up "anchors" in different areas of town, seeding economic growth money outside the Downtown and Midtown areas where the administration has largely focused during his first three years in office. Political analyst Otis Sanford says this is one answer to the Mayor's critics who might argue that he hasn't paid enough attention to other areas of town. As Strickland begins his reelection bid, Sanford says he should take care not to claim credit for reducing poverty without being more specific about the actual reasons for that reduction. Otherwise, Sanford has dubbed the mayor "Big Mo" for the momentum he has made improving various aspects of Memphis life, including upscaling the police force, fixing more potholes and improving the growth of black businesses. Click here for video of the Mayor's State of the City address.